The purchase-to-payment cycle can be challenging to manage, given the high volumes of transactional data—often housed in multiple IT systems and applications—and complex authorization processes. The financial consequences of errors, duplicate payments and vendor and employee fraud can run into millions of dollars of losses each year. ACL has an extensive library of analytic tests that can help you uncover critical control exposures within the requisitions, purchasing, receiving, payables and payments process. 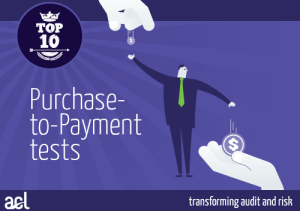 Check out our Top 10 P2P tests and put some of these into action right away.